Richard Freeman has been involved in Thermoforming for over 35 years, the last 30 with Freetech Plastics in Fremont, California. His experience providing pressure-formed products in the close tolerance, technically demanding, and highly competitive environment of Silicon Valley has led to a number of key innovations. It also gives him a unique perspective on Production, Quality, Marketing, and Design Issues. Rich’s articles, company and products have been featured in Plastics Engineering, Appliance Manufacturer, Innovation, Machine Design, Plastic News, Mechanical Engineering, and International Designer to name a few. He has spoken out about many issues important to thermoformers over the years. Considered one of the founders of the West Coast style of thermoforming, he’s been a regular feature of the SPE Thermoforming Division conference programs, both in the USA and in Europe, as well as other SPE and industrial design forums. 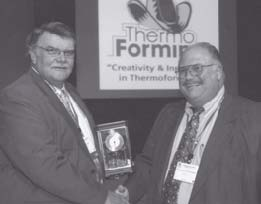 His continual promotional efforts in behalf of the industry have benefited not just his own company but the thermoforming industry as a whole. Rich has spoken at numerous SPE thermoforming conferences and has had a major influence on almost every heavy gauge program since the conference’s inception. Freetech Products has won numerous industry awards including the 1996, 1999, and 2004 People’s Choice Awards, the Thermoforming Industry’s top prize. Freetech has provided the pressure-formed parts for 7 ID Magazine award winners and has worked hard to make the design community aware of thermoforming possibilities. Since 1998 he has both spoken at and put on many exhibitions on behalf of the Thermoforming Division at IDSA conferences to raise awareness of our industries’ many capabilities. Rich’s first thermoforming project at 8 years of age was a draped formed acrylic candy dish for his Mom. It was the first, but not last, time he burned off his fingerprints on hot sheet. Rich started Freetech Plastics in 1976. Their first thermoformed product was polycarbonate voice coil protectors for early hard disk drive components for IBM. Not happy with the quality of the cast tooling then available needing to provide high detail parts for Silicon Valley but not having pressure forming equipment, Rich saw possibilities of combining CADCAM and thermoforming. He then developed a a tooling method for achieving high definition parts without the use of pressure. With CNC trimming, Freetech could produce parts with very close tolerances, machined components, and other features not usually associated with thermoforming. This led to what’s known as the West Coast style of pressure forming. This method utilizes dramatic shapes, sharp detail and extreme undercuts to create a whole new look for thermoformed products. As more modern equipment became available this only got better. Rich has been an active member of the SPE Thermoforming Division Board of Directors since 1991. He currently is responsible for the Thermoforming Division’s web page and Machinery Grant program. As a member of the Division’s good works committee, he developed the Thermoforming Machinery Matching Grant Program which has placed thermoforming machines and other related equipment in 14 schools so far.